This fall in all Butcher steak houses! Japanese wagyu beef! It is know for its top quality and unique, incomparable taste. It is the rarest marbled meat in the world. 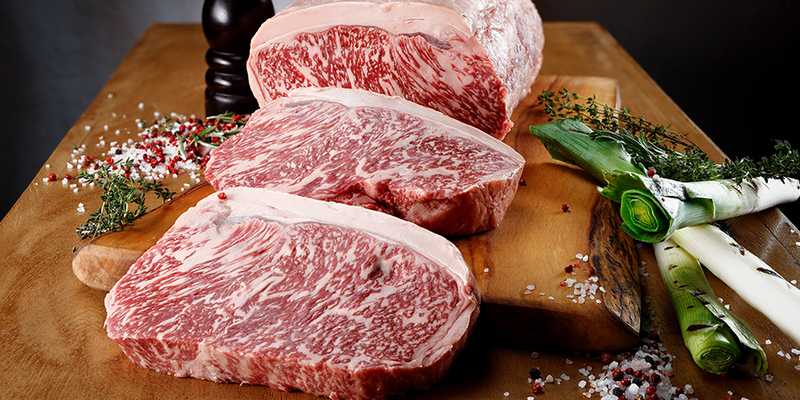 Wagyu steaks have the same high status as Rolls Royce cars and Rolex watches. The Japanese say that you don’t need teeth for this meat! WAGYU STRIPLOIN STEAK 300 gr. — 6300 rub. WAGYU FILLET STEAK 200 gr. — 6900 rub. WAGYU RIB-EYE STEAK 300 gr. — 6500 rub. WAGYU FLAT STEAK 250 gr. — 5900 rub. SAMURAI’S SKEWER 200 gr. — 3900 rub.